Unleash your creativity upon the Makerbot Replicator! You can model anything imaginable on our 3D software and print it into the physical world. The Arduino hardware and software was designed for artists, designers, hobbyists, newbies, and anyone interested in creating interactive objects or environments. Arduino can interact with buttons, LEDs, motors, speakers, GPS units, cameras, the internet, and even your smart-phone or your TV! 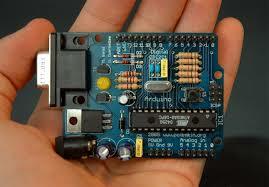 This flexibility combined with the fact that the Arduino software is free, the hardware boards are pretty cheap, and both the software and hardware are easy to learn has led to a large community of users who have contributed code and released instructions for a huge variety of Arduino-based projects.